The Logitech CRAFT Advanced Keyboard with Creative Input Dial is a $200 “advanced keyboard” for Mac and PC that features a creative input dial for more easily accessing context-specific controls while working. I’ve been testing one out over the past few weeks to see if the company’s latest Mac/PC accessory can live up to its price tag. 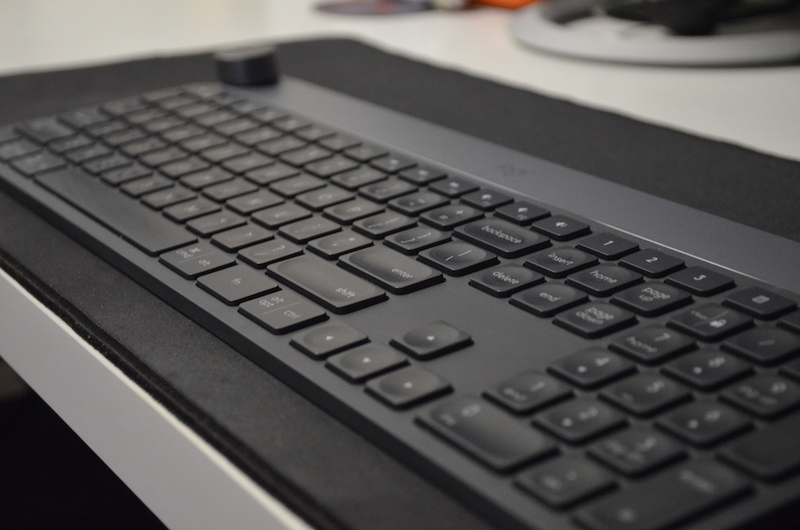 At 2.1 pounds, the full-size CRAFT keyboard feels pretty heavy when you unbox it. If you are coming from a traditional Apple Keyboard then you will definitely notice a huge difference in size and weight. On the upside, there is no chance of this keyboard sliding around as you type. The keys are not any wider apart than a regular full-size keyboard, however, it will take some getting used to if you are coming from the chiclet keys on the new MacBooks. The keyboard features smart backlighting, which can detect your hands getting close to the keyboard at night and slowly turning on the backlight for you before you even start typing. The backlight on the keyboard will also automatically adjust based on ambient lighting conditions. The one downside of the backlighting is that it bleeds around the edges of the keys quite significantly. There are also proprietary buttons above the insert/home/page up keys that let you dynamically switch between any three connected devices. 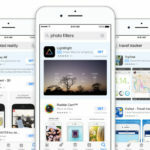 This feature comes in very handy when you are connecting across multiple devices and can really speed up your workflow. Standard Mac system controls are clearly labeled along the top row of function keys, but are numbered slightly differently due to an additional “Show Desktop” function (F5). The modifier keys are labeled with both Mac and Windows commands, making it even easier to use this keyboard across both platforms. Personally, I have this keyboard attached to my Mac and a Windows-based machine and switch between them with the preset macro buttons we discussed earlier. Included in the box is a small USB Unifying receiver that uses 2.4GHz wireless technology to provide a connection up to 33 feet (10 meters) away. It’s capable of connecting up to six keyboards and mice to one computer. In my experience, using this receiver is a lot more reliable than connecting via Bluetooth. However, the Bluetooth option is still there for those who wish to use that instead. The aluminum smart dial, called the Crown, sits on the top-left of the device and is touch sensitive. The Crown can be tapped or rotated to adjust various settings like brightness, font size, brush size, and so on. 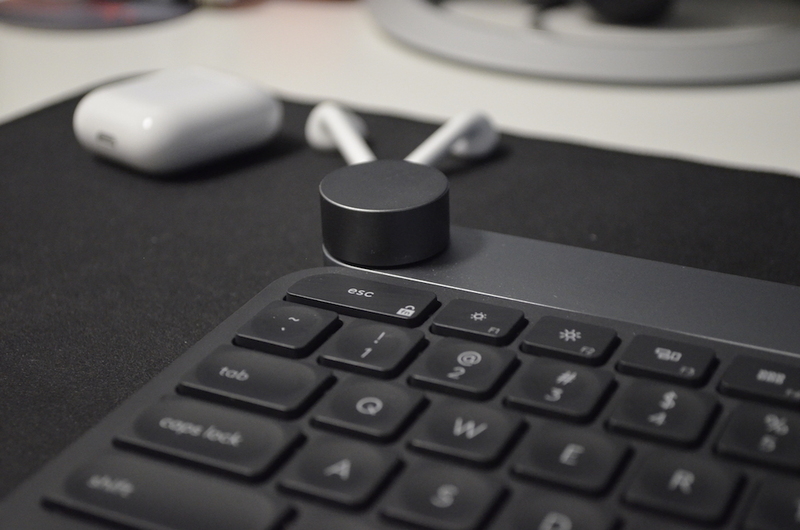 If you’re a Mac user who has wanted something like the Microsoft Surface Dial, which sports similar capabilities but only works with select Microsoft products, the CRAFT Advanced Keyboard is definitely your best option. The Crown’s functionality can be adjusted using the Logitech Options software utility, which has custom profiles for tools like Adobe Photoshop, Adobe Illustrator, Chrome, Firefox, and many more. Logitech currently has profiles for Microsoft Word, Excel, and Powerpoint, but they only work on Windows. Turning the Crown moves you through the menu, clicking it selects the appropriate tool, and turning it again adjusts the value or setting. After using it for a few hours, the Crown became second nature and made performing simple tasks a lot quicker. Using the Crown this way turned out to be a convenient method of performing these functions without having to look down at the keyboard, and made up for the fact that my MacBook was closed and the trackpad was no longer accessible. Additionally, the touch-sensitive Crown can be set up to access a variety of global Mac controls, so you can use it do things like activate screen zoom, navigate between apps, adjust brightness, or even assign to it a particular shortcut key combination. 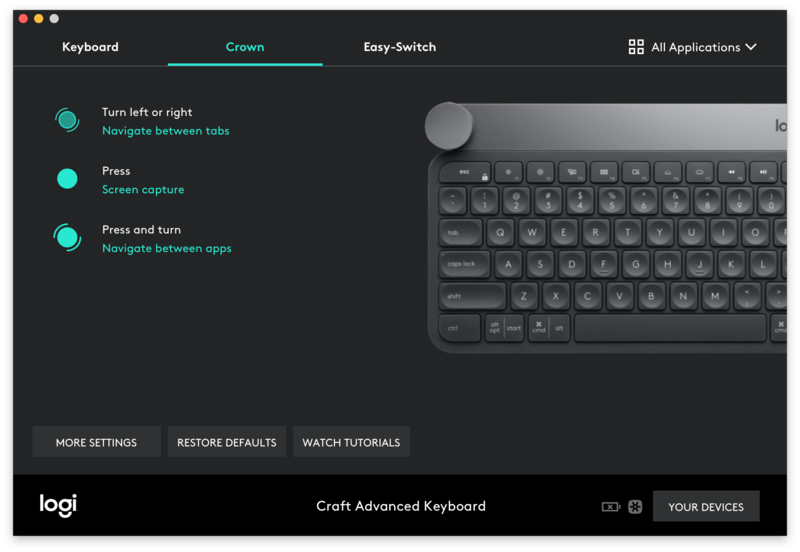 The Crown and the function keys can be customized extensively though the Logitech utility app. Pairing the device for the first time was super simple, especially given that I already had a Logitech receiver attached to my laptop. For sake of testing, I also paired the device using Bluetooth, and this worked just as well. Pairing and switching between all my devices, which included a MacBook Pro, Windows desktop, and an iPad Pro, was seamless. The most notable thing about switching to the Logitech Keyboard was a longer than normal adjustment period. For me, it took me a day or two of use to get fully accustomed to the keys. However, after getting used to the keyboard, I haven’t gone back. The CRAFT’s key travel is very reminiscent of pre-butterfly era MacBook Pro keys, which many users will undoubtedly welcome. The design of the keycaps, with a dip in the middle, is very comfortable to type on and gives your reassurance that you are pressing the center of the key. In my experience, finger fatigue isn’t an issue with the CRAFT, and the angle of the keyboard feels just right for use on a computer desk. 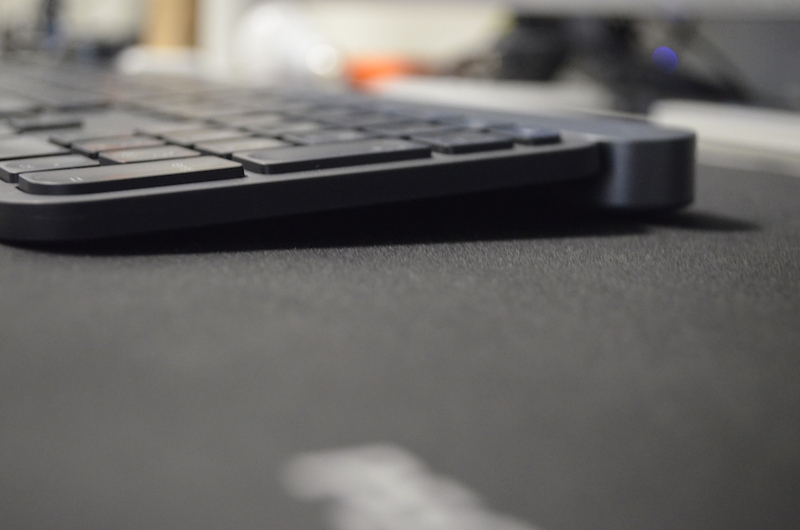 At the right-hand side of the keyboard’s rear edge is a USB-C power cable for charging. The device comes with a USB-C to USB-A cable, which will charge the 1,500mAh battery in less than 2 hours. There is also an LED strip at the top of the aluminum strip that will glow red when the battery is low, and glow blue when it has a full charge. In my personal usage, the battery of the keyboard has been average for a wireless keyboard of its size. I find myself having to charge the keyboard once every two week with normal usage (a few hours per day). But to me battery life for a keyboard like this is not really a huge factor, since it will still work while its plugged in. Also given the weight of this keyboard, I would not personally travel with it, so having to worry about battery life on the road was not an issue for me. If you are looking to travel with your keyboard, this may not be the best option for you, given its weight and battery life. Overall, I found Logitech’s CRAFT Advanced Keyboard to be a solid, well-designed accessory that has become my main keyboard. Despite the mediocre battery life, the keyboard was comfortable to use and made connecting between multiple devices a breeze. The most innovative part of the keyboard was the Crown, which was intuitive and allowed me to speed up my daily workflow with tons of customization options. After a gentle learning curve and a couple minutes of customization, the keyboard just becomes a natural part of your daily workflow. If you are a professional who uses a niche creative application, you may run into some issues, as third-party software support for the Crown is minimal. The only other real downside of the keyboard is the price. At $259.99 (CAD), the keyboard is quite expensive for the average consumer, regardless of whether it has the Crown or not. In my opinion, the keyboard is definitely worth the price given its premium design and innovative set of features. However, to justify the cost, I would say that you should be using this keyboard as your daily driver. 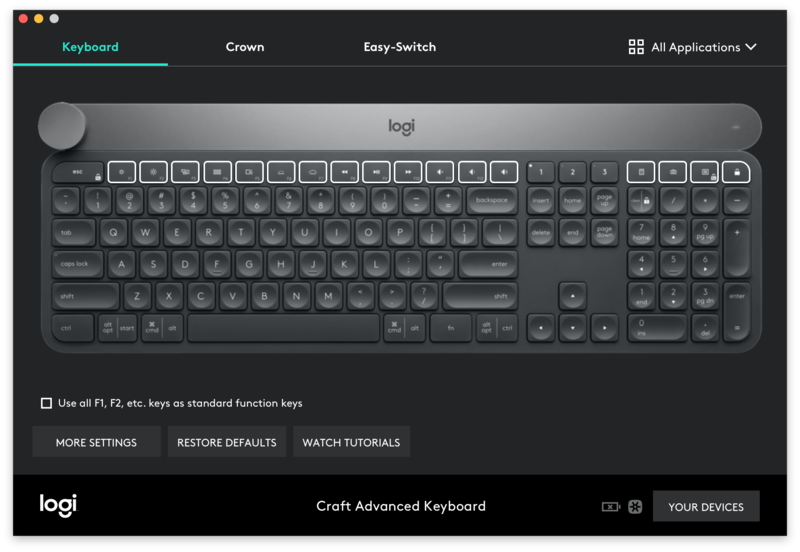 The Logitech CRAFT Wireless Advanced Keyboard can be ordered directly from the company’s website.